Life is full of laundry! That was actually the name of the first, and only, album created by the rock band I played with in high school. And while our music did little more than make my parents the bane of our neighborhood, there was a lot of truth to our album title. It turns out there really are only 3 certainties in life; death, taxes and laundry. Back when my kids were teenagers, my daughters would seemingly change clothes 10 times a day. I swear they would wear something long enough to make an appearance in the living room, then reappear sometime later in an entirely different outfit. And do you think they were hanging the first number up after taking it off? Of course not! That’s too much work! They would just toss it on the floor or when I was lucky, into the laundry basket. It seemed like our wash machine never stopped running back in those days. My son on the other hand, made habit of wearing the same thing day after day after day, which led to a host of other issues, stink not being the least of which. But I digress, as those were the wonder years. You know, wondering just who had birthed such heathens! Of course the centerpiece of this particular contest from HGTV is the 500 smackers. That’s $500 to you not familiar with colloquial Native American idioms. I’d probably personally just put that money aside for the next mini “crises” that arises in my life, you know things like the car breaking down, the washing machine giving out, or an unexpected trip to the doctor. Perhaps that’s the fourth certainty in life, things fall apart. 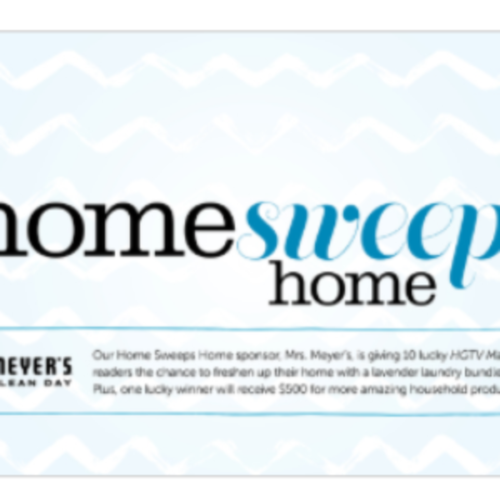 Even if you don’t win the cash, the Mrs. Meyers Lavender Laundry Bundle looks nice. Mrs. Meyers features biodegradable laundry detergent that’s tough on stains but easy on your fabrics. They are well known for their garden fresh scents and I’m sure the lavender is no exception. Don’t forget, just like with all the other giveaways from magazines, you DO NOT have to accept their free trial magazine in order to enter. There is always a way to enter without accepting the trial, although some make that easier than others. I don’t really encourage you to accept the trial even if you are interested in the magazine, just because depending on the offer, you may be auto-billed at some point, and at the very least, you’ll have one more hoop to jump through to cancel the trial before you are billed. Let my know in the comments section below who does the laundry in your house. Do you have kids, and do they help out with the laundry? Do they wear 5 outfits a day or do they wear the same outfit for 5 days? Good luck to all my subscribers. Hello Granny, I am the primary “laundry-doer” in my household of 3 sons. None of them ever help me out with laundry. So I’ve had to conquer many, many loads of laundry and have self-proclaimed myself as the pre-soaking queen for all the stains that they somehow found. Because of my vendetta with grass stains 😁 I would absolutely LOVE to win this package! 😁 Good luck everyone! Please enter me to win Lavender Laundry Bundle + $5oo.